Last night, we celebrated MiddleJ's 17th birthday. I'm totally stunned at the fact the kids are growing up at light speed and turning into charming young adults. The milestones (birthdays, graduations, etc) feel like suckerpunches - we see all the kids with relative frequency, but it's the milestones that remind us all that they're growing up. In any case, I decided to pull a few articles out of my winter closet for the occasion. It's been Very Very Cold (<60 F), which gives me a chance to wear my beautiful knits. I chose charcoal slacks, one of my Jackie O turtlenecks, a black silk cardigan, and my Juno Regina stole. I knit the stole a million years ago, and it doesn't get nearly enough wear. See? 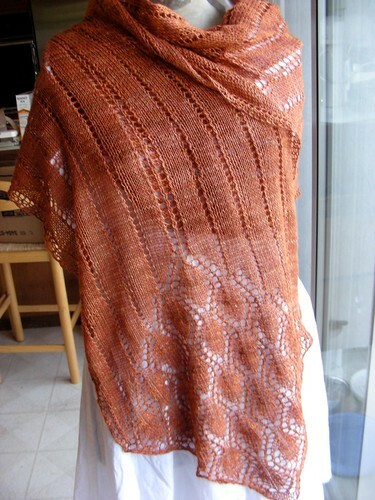 Juno Regina, knit out of Handmaiden Sea Silk in "Pumpkin". 'tis the season, yo. Then, out of NOWHERE, came an amazing moment. Another niece, who I'll call Galette (because she is sweet, not fussy, and does her own thing), paid my Juno a compliment. "Aunt Jasmin, your scarf is really pretty," says Galette. "This? I knit this," I said, a little shocked. "You MADE this?" Galette and LittleJ took time to investigate the pointed ends. "Could you make me one for Christmas?" Galette asked, hopeful. I snorted, "Christmas is a month away. That is so not happening." "Next Christmas?" Galette was still trying, and I found her optimism adorable. "No. But, I can teach you how to knit, and by next Christmas, you could make one of these for yourself," I offered sincerely. At this point, LittleJ mentioned that she had gone back to her knitting. I taught all Three Js to knit when Andrew was living in the cottage attached to their house, seven or eight years ago. The kids were interested, and as any self-respecting knitter knows, you strike while the iron is hot and plant that seed early. Long, long ago, LittleJ wanted to make a Gryffindor scarf. So, as any good aunt would, I enabled. I bought them Kids Knitting by Melanie Falick, hoping that the initial lessons would spark a lifelong knitting flame. LittleJ worked on it for a while, but her interest waned. It happens. In any case, as the night progressed, it seems that all the girls there (MiddleJ, LittleJ, Galette, and the Equestrienne) want to start (or in some cases, revisit) knitting. When they started talking about this, the hills were alive with the sound of knitting, and I was Maria Von Trapp. Since then, in my imagination, I'm leading the kids in a rousing rendition of "Do Re Mi" (but with a knitting twist "YO, a stitch, a hol-ey stitch. K, a simple knitted stitch. V, the shape a knit stitch makes..."). My imagination *might* have completely run away with me. Maybe. Me? I'm just glad that I was able to leverage knowledge that evil industries have collected for good. Get them while they're young, and they'll be knitters for a lifetime. Or at least, an aunt can hope. Oh, that is so cool--go Jasmin! That's how my mom got me back into knitting: said no when I wanted her to knit me a sweater in her magazine I highly coveted. And look where that got me. Like, ZOMG, will it go with the heels Aunt Jasmin???? PS: Old? Old my big white arse little girl. I agree! A friend of mine formed an after school knitting club at the elementary school down the street from my house. She had been asking me to come help. I did it for the first time last week, and had a blast teaching 3rd and 4th graders, boys and girls alike, to knit. I'm pretty sure I'm going back after the holiday!!! Way to go! I love "Kids Knitting". When my daughter was in elementary school we gave that book, yarn and needles to all her friends. They all learned to knit to various degrees but one loved it so much she went on to knit through high school and even learned to crochet. The gift of knitting is the best gift ever. Your Juno Regina Stole is stunning. I bet you looked fantastic! Oh Jasmin. That is so fine. Now can you add to the song a bit more? OR maybe we can all add to this and have our very own song. I have a beginners class on Monday nights that would so be into it. lovely stole. I just love this time of year when the trees are laden with yellow, and red leaves. It makes me happy and a bit relaxed. That is awesome. I have high hopes of one day inspiring one of my nieces to start knitting. I love it. LittleJ has it together!